Exhibition Division | DSIIDC - Delhi State Industrial And Infrastructure Development Corporation Ltd.
DSIIDC participates in exhibitions in India and abroad from time to time. The main focus of Exhibition Division is on India international Trade fair IITF which is held every year in Pragati Maidan, New Delhi in the month of November for show casing the activates and the projects of Delhi Govt. Besides, Exhibitions are held in various cities of India for promotion of traditional crafts man of Delhi Artisans. DSIIDC is the nodal agency of the Govt. of Delhi for organising exhibitions at National and International level to promote products manufactured by SSI Units, Small Artisans, Craftsmen and Weavers of Delhi.In additionit also organises the Delhi pavilion on behalf of Govt. of Delhi during IITF which is a most prestigious event. Besides this various other exhibitions are also organised in the Delhi pavilion co-inciding with other major events organisedby ITPO at Pragati Maidan. Applications for participation in the different fairs are invited either through press advertisement or by contact, the different Industrial Associations, Apex Bodies and Individual Units who are on our mailing list. Handicraft/Handloom fairs are also organised at the National level so as to promote the traditionals activity. The space in these exhibitions is also given free of cost to small artisans, Craftsmen and Weavers. 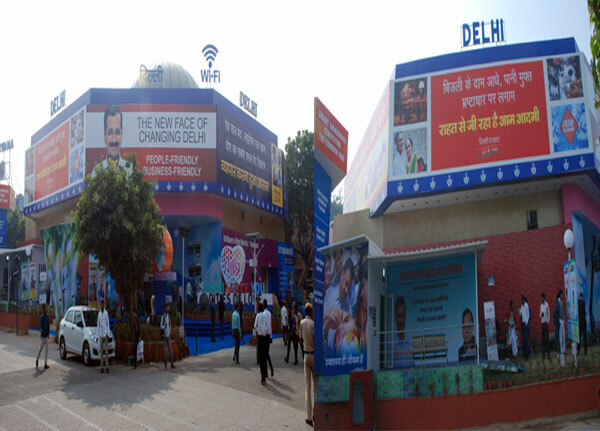 The Corporation organised the Delhi Pavilion at IITF Pragati Maidan and five handicrafts fair at Dilli Haat, Chandigarh, Nagpur and Jabalpur.